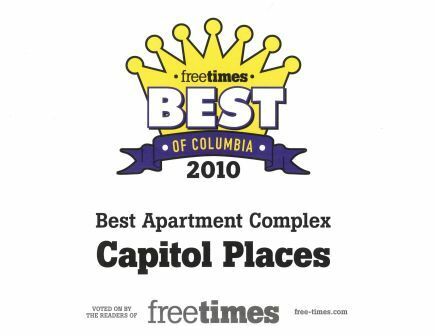 Congratulations to Capitol Places for being voted Best Apartment Complex in Columbia by Free Times readers. Mingle & Jingle on Main is a continuation of Frame of Mind’s Art Series held the first Thursday of every month. The event is a holiday themed block party that will include various visual and performing artists including artists Jean Bourque, Virginia Scotchie, Stephanie Britt, Eileen Blyth, Howard Hunt and the Village Artists, and many more. The old Silver's building will feature the works of Dre Lopez, Sammy Lopez, Nikolai Oskolkov and Kirill Simin with a performance by dancer Sherry Warren and music being spun all evening by DJ GLDFNGR. The Nick will be projecting seasonal images on some of the buildings and provide tours of its future home. Free Times will have a taste of Delirium Tribal and Columbia Alternacirque. Mac's on Main, Villa Tronco, and The Whig will be on hand for food and drink. There will also be a sneak peek of Crafty Feast that is being held on December 12th. 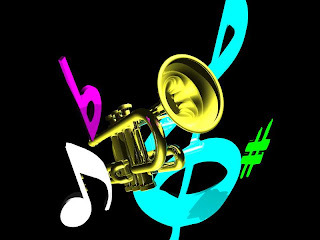 Carolers and music will be on the street while Sonny D and friends (w/ the Palmetto Swing Dancers) will be inside Gotham Bagel. Several of the featured downtown retailers (such as the Museum Shop and Capitol Places) and restaurants will be extending their hours for the event. As an added bonus, you will have a chance to meet and greet with some of the cast and crew from Dog Days (a local film directed and produced by Kirk Bair). Don't miss the opportunity to support our own as they push to make Columbia a shining star in the independent film industry. Tom Prioreschi was recognized recently at a gala to honor a group of individuals who have made outstanding contributions to Columbia’s neighborhoods and business community. Prioreschi is the founder and principal of Capitol Places, LLC, as well as chief operating officer of US Development. E. W. Cromartie, II, Columbia city councilman, District II, and chairman of the Village Appreciation Celebration Advisory Committee, presented the welcome and explained the purpose of the celebration. He said to recipients that because of their commitment to serving the community, they are all extremely deserving of such recognition. Over the years, he said, they have voluntarily sacrificed their time, energy, services and resources to ensure that Columbia thrives like never before. US Development is currently expanding its business model in the Southeast and is scheduled to soon open offices in Virginia, North Carolina and Georgia. As in Columbia, the company is focused on historic buildings in or around the center of the business district. The structures then are redeveloped into residences and for mixed-use purposes. District II, Councilman Cromartie’s constituency, is composed of downtown neighborhoods. The city center corridor – Main, Assembly and Huger streets – also are a part of this district. Councilman Cromartie was instrumental in developing the Charles Drew Wellness Center. He also is involved in the revitalization and development currently underway along Harden Street. The awards were presented before a packed house Oct. 8 at the Columbia Metropolitan Convention Center on Lincoln Street. Other program participants included Cynthia Hardy, Maxim Communications Group/Total Carolina Care, who served as mistress of ceremonies and introduced the honorees; and Reverend Rodella Burns, Bishop’s Memorial AME Church, who gave the invocation and Blessing of Food. Reverend Dr. Blakely Scott, First Nazareth Baptist Church, led the Veneration of Our Ancestors and delivered the benediction. Entertainment was provided by Benedict College Concert Choir Director Dr. Linda Kershaw, and the Benedict College Concert Choir. This is a new campaign dedicated to bringing awareness to Columbia citizens and encouraging them to think before they shop in other cities or online. You will be surprised to find that most everything you need can be found right here in Columbia! Know your facts: If each employed person in the Columbia area spent $100 each month in a retail business, it would generate more than $32 million in revenue. Based on a study commissioned by the Andersonville (Chicago) Development Corporation and Chamber of Commerce, for every $100 spent in locally owned independent stores, $68 returns to the community through taxes, payroll, marketing, and other expenditures. If you spend that in a national chain located in our community, at least $43 stays in the local area. Spend it in another city or online and nothing comes home. 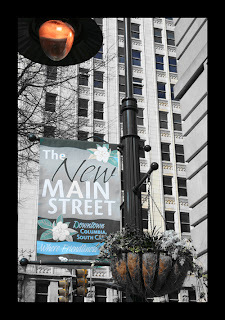 There are many unique and exciting locally-owned businesses right in the downtown area. Explore areas such as Devine Street, the Vista, and Five Points. Think before you shop. US Development, USD, a Columbia-based company specializing in mixed-use and infill redevelopment, has selected Elliott Davis, LLC, to serve as its accountant and business advisor. David M. Bryant, USD president, says, “Tom, Jeff and I took our time and did quite a bit of research before retaining Elliott Davis. It was essential to choose a firm with the credentials and vision to complement our goals and objectives. Ultimately, we went with Elliott Davis because they best fit our needs and future direction.” Bryant and Tom and Jeff Prioreschi are the founders and principals of USD. USD, which was formed in January 2009, focuses on historical landmark renovations and center-city properties in the Southeastern region of the country. Its first acquisition – on Lady St. in Columbia – was announced several months ago and will be converted into independent living, luxury apartments called The Dakota. Elliott Davis has been in business since 1925 and has garnered an outstanding reputation for its accounting, tax and consulting services. The firm has 50 shareholders and 400 employees in 10 offices throughout the Southeast. Elliott Davis is the largest accounting firm in the state. Through its acquisitions, US Development is redeveloping properties for adaptive reuse, making way for both residential living and commercial businesses. The company plans to maintain a building’s existing historical significance, while preserving original construction materials and structural integrity. The residential component of the projects will have extensive modern amenities. If you have not been in the past or you are just moving in to the neighborhood, the Main Street Marketplace is a weekly occasion not to be missed. Many will remember its occurrence during the summer and may not be aware of its re-emergence in the fall. The market takes place every Friday during September and October at Boyd Plaza in front of the Columbia Museum of Art. It is open from 10 a.m. until 2 p.m. and features everything from fresh produce to arts and crafts. You can browse through the jewelry and handbags or pick up an interesting read. This is certainly an attractive way to spend your lunch break and get some fresh air. City Center Partnership offers a free shuttle service that runs all the way from Gervais to Elmwood and from Assembly to Marion Streets. This is certainly a service to be utilized at other times and the Downtown Hospitality Teams have proven to be extremely helpful. You can reach them during the day at 803-233-0620 or in the evening at 803-309-7758. Feel free to check out City Center Partnership’s website at citycentercolumbia.sc to keep in touch with the downtown area. While you are in vicinity of the Columbia Museum of Art, be sure to stop in and catch Cleve Gray: Man and Nature before it ends on September 27, 2009. New residents can take advantage of their free passes provided in their lease packets. If they are expired, you can pick up new ones at our leasing office. Sundays offer free admission into the museum provided by Blue Cross BlueShield of South Carolina. The museum is open Wednesdays - Saturdays 10 a.m. - 5 p.m. as well as the first Friday of every month from 10 a.m. - 8 p.m. (until 5 p.m. in December), and Sundays from noon- 5 p.m. For more information visit their website at columbiamuseum.org. WACH Fox News is thrilled for its newest program, Arts Watch with William. Arts Watch, is a segment of the WACH Fox News Good Day, and is hosted by William Starrett, the artistic and executive director of the Columbia City Ballet. The show airing every Thursday morning at 7 a.m. and 8 a.m. will inform audiences about the latest visual and performance arts events taking place in Columbia and surrounding areas. Each show will be shot on location of the venue that the event will take place. Starrett will give viewers all the information they need to attend these events, from show times and dates to where to buy tickets- even what to wear and where to park. He will also interview the directors, performers and creators, giving a unique perspective that is sure to educate and stimulate the viewers. WACH Fox and Starrett hope this segment will help raise awareness of and support for all arts disciplines in Columbia. 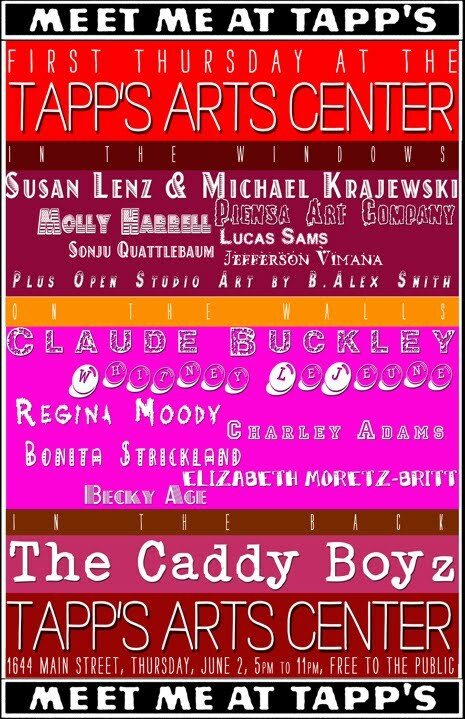 Tune in every Thursday at 7 a.m. or 8 a.m. for all of Columbia’s artistic happenings. Starrett has been a leader in the Columbia arts scene for over 20 years, first as a performer and principle dancer, guesting in Columbia from New York City, and later as a director, choreographer and teacher throughout the state. For more information, please visit midlandsconnect.com. Article courtesy of City Center Partnership. City Bites, a casual dining restaurant, has leased space in the Capitol Center building on Main Street. Beronica M. Whisnant of Colliers Keenan brokered the lease with M&J Wilkow Ltd. for the 3,752-square-foot deli space, located at 1201 Main St. in downtown Columbia. City Bites, owned and managed by Alexandra and James Hazelton, will offer a dine-in and carryout menu for breakfast and lunch on weekdays, featuring hot entrees, soups, salads, sandwiches and wraps, desserts, daily specials and a “grab and go” offering. The tentative opening date is set for mid- to late July, after minor construction and design improvements are completed. One of the unfortunate parts of turning the Sudworks Taphouse into the new Elbow Room was the severing of ties with booking agent and bar manager Travis Maynard. But it didn’t take long for Maynard to find a new gig; he and Solid Entertainment’s Dave Britt are opening up a new venue called The White Mule, a music pub and eatery at 1530 Main St. That address, you’ll remember, was the site of the dearly departed acoustic café Jammin Java, and Britt says the White Mule will have a similar approach. There’s no opening date set quite yet for The White Mule, but Britt estimates the venue to be up and running by the end of June. Keep checking thewhitemule.com for updates. Color The Playlist excited: Maynard did a pretty bang-up job booking Sudworks (and, previously, the Five Points Pub), and Britt has a long and notable track record from his involvement will All-In Entertainment and stints booking and running local venues such as Senate Park. If nothing else, The Playlist is excited at the prospect of live music returning to Main Street. In fact, we’re calling it now: Between the Columbia Museum of Art, The White Mule and the soon-to-be-relocated Nickelodeon Theatre, the corridor of Main Street between Blanding and Hampton streets will be 2010’s new hotspot. This year’s ultimate street fair took place right here on Main Street with the return of the Urban Tour on May 7, 2009. The number of expected attendees almost doubled this year with 2-3,000 guests partaking in the annual neighborhood festival. Visitors and residents toured the area, enjoying the warm weather and relaxing sounds of Soul Food Jazz playing at Boyd Plaza in front of the Columbia Museum of Modern Art. Local restaurants and retailers opened their doors, welcoming the new patrons with free giveaways and gift certificates. Participants eagerly made their way around the event, marking all stops on their way to the finale at the Nickelodeon Theatre for their chance to win different door prizes. Free carriage and shuttle rides were provided for those searching for a different means of travel, and Bud Light Lime offered landmarked beer stops along the way. Capitol Places received a vast number of visitors at its own stop, where guests were treated to a variety of delicious Greek dishes, catered by Greek Boys on Sumter Street. Following the appetizers was the main course of touring a model apartment home in the historic Kress Building. Everyone was delighted to get this sneak peek into Main Street living. Columbia, SC – November 18, 2008 – City Center Partnership (CCP) celebrated the downtown Business Improvement District’s (BID) seventh year anniversary at its annual meeting on Monday, November 17, at theColumbia Museum of Art. A presentation showcasing City Center Partnership’s accomplishments over the past few years was presented by CCP Chairman and CEO of Edens & Avant, Terry Brown. Brown also presented the Chairman’s award to Karen Brosius, Executive Director of theColumbia Museum of Art, for the museum’s impact on the community including the new Keenan Fountain and world exhibits such as From Turner to Cezanne. Jeff Prioreschi, President of Capitol Places and a Principal with US Development also received the Chairman’s award for his work on redeveloping some of the most difficult downtown buildings into great living and commercial spaces. City Center Partnership awarded downtown legacy retailers who have been in business in the BID for 50 years or more. • Sylvan’s Jewelers for 111 years. A Business Improvement District (BID) provides enhanced improvements and activities, such as security, maintenance and marketing, in addition to those services provided by local government. A property-based BID is based upon the “benefit assessment district” concept, which provides for an assessment on real property and improvements upon real property to be raised within a specific geographic district with the proceeds directed back to the district to provide enhanced services that benefit the district and properties located within the district boundaries. Quoted in the local newspaper of 1913, the original architect Julius Harder from New York said of his building “not even one sixteenth of an inch was spared on the design of this building.” Located on Main Street, the 135 guest rooms and suites provide first class amenities and all of the comforts of home, gourmet snacks, plush robes, layers of luxurious down bedding and Sheraton’s signature Sweet Sleeper Beds. Additionally, all rooms feature HSIA and WIFI, Starbucks Coffee and Tazo teas, 20” flat screen televisions in the bathrooms, mini-bars, and individual climate control for your comfort. The Sheraton Hotel is bringing a touch of New York and San Francisco to its mix of dining and nightlife. This fine dining restaurant provides all day dining featuring global cuisine from their award-winning Executive Chef and a very progressive wine list. Nestled within the bank’s original safe this martini lounge remains as a historic centerpiece of the lobby hotel and a fancied hotspot for those who insist upon their martinis served shaken not stirred with a twist of sophistication. 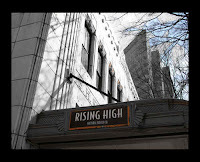 On top of the oldest high rise in Columbia you can “chill” in the hippest bar in Columbia. Watch the sunset over this hospitable southern city with a refreshing drink and a decadent dessert. In Columbia’s new underground you can find relief from the hustle and bustle with a good stiff drink and even better company. Catch the game, have a bite to eat, call your friends, wait, they’re already here. At their Link@ Sheraton café they proudly serve Starbuck’s Coffee in the lobby you can always find a social atmosphere to mix, mingle, and keep up with the virtual world tool. In addition to all the amenities the hotel has to offer, also take advantage of the Sheraton’s unusual and extraordinary corporate meeting space. Originally built as a bank, circa 1924 is now an elegant special events and meeting location. Sophisticated features and unrivaled characteristics illuminate the meeting space that comes fully wired with WIFI/HSIA internet connectivity. 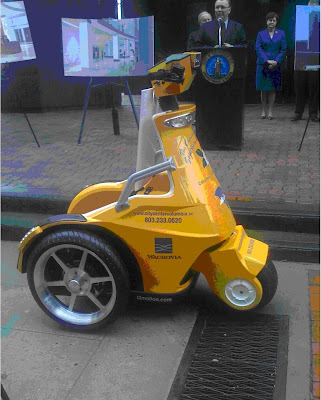 During Wachovia's announcement and commitment to stay on Main Street Columbia, they very graciously donated a T-3 Motion electric vehicle to City Center Partnership. This will enhance the safety teams ability to patrol quickly and efficiently downtown. Wachovia will move to new home in Columbia. 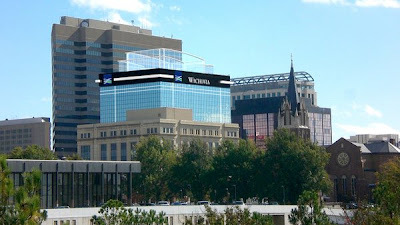 Wachovia will relocate its Midlands headquarters across Main Street to an office building set to undergo a renovation that could include a 29-foot glass sculpture on the roof. “We continue to show our commitment to Main Street and the city of Columbia and the city center,” Wachovia’s Midlands market president Greg Lapointe said. The $5 million renovation also will add ground-floor video displays showing area events and possibly TV broadcasts, and a two-floor atrium leading to a revamped Wachovia branch. The renovation will include a new 5,500 square foot financial center modeled after urban branch offices in New York and Los Angeles. Who the heck is Coleman? If you want to know how to get tickets to your favorite theater show or ballet -- quick and in a hurry -- ask Coleman. Coleman is the downtown Columbia Marriott's new cultural concierge service -- personified. Starting June 1, the Marriott and its new ticket desk will be a one-stop destination for its guests and Columbia residents to buy tickets for events at the Colonial Center, Workshop Theatre, Nickelodeon, S. C. Philharmonic, Columbia Classical Ballet, Trustus Theatre, the Columbia Museum of Art and other venues. We meet every Friday at 5:15 for an hour of walking, talking and being seen. The walk is almost always followed by an exciting cultural event, like an art opening or lecture. Meet us at Tapps in the small courtyard on Main Street, next to the gym. Wear nice clothes, comfortable shoes and a smile. Plenty of parking is available on/around Main Street and Blanding. Brooks Garner of WIS-TV showed off Capitol Places' new Segway during the weather cast on March 25th. Capitol Places Director of Operations, Chris Chessick, uses the Segway to travel between properties and construction projects. • The best locations for downtown retail are on Lady Street from Main Street to Huger Street and on Main Street from Gervais Street to Laurel Street. • The city needs more sites suited for retail. Only 28 percent of the building spaces on Main Street house retail. On Lady Street, it’s 19 percent. • Main Street has too many fake facades, tinted windows and unattractive signs. All turn off shoppers. • Lady Street needs more in-fill development, but it should push toward Main rather than Huger. • The city should provide forgivable loans and other incentives to entice retailers downtown and building owners to improve properties. 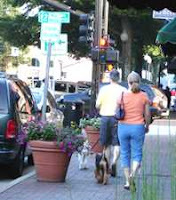 • Lady and Main streets should be better connected by streetscaping and an easier crossing at Assembly Street. • Downtown needs more retailers that appeal to middle- and upper-income shoppers, such as bistros, delis and shops that sell prepared foods, books, stationery, apparel and home furnishings. • The Vista should continue as an arts district. • Downtown must attract shoppers from the suburbs until there are enough downtown residents, employees and travelers to support strong retail. 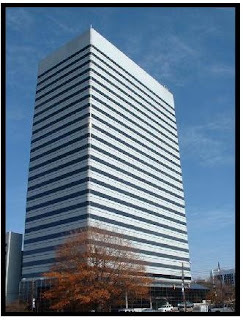 The new Main & Gervais Office Tower is situated on one of the most prominent sites in all of downtown Columbia, the corner of Main and Gervais Streets, overlooking the South Carolina State Capital Building. As if the grounds of the capital were extended across Gervais Street, the existing public plaza along the tower’s South-facing façade has been refurbished with new landscaping and lighting, creating a park-like setting for the new building. The plaza can be enjoyed by passers-by on a daily basis and can also be the venue for more formal gatherings. The eighteen-story, 200,000 square foot tower has been designed to respond to the prominence of its important setting. In addition to office space for several well-known members of the downtown Columbia business community, the building program includes a lobby-level branch bank, a signature restaurant with outdoor dining on the plaza, and a 540-space, six-level parking garage. The tower’s simply sculpted form, sheathed in all glass, makes a powerful statement on the city skyline that can be seen from multiple vantage points. The façade facing the Capital has been articulated with vertically-accented aluminum mullions to express both the prominence of the site and the height of the tower. 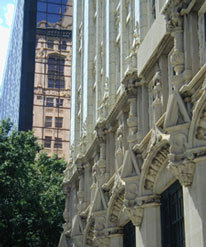 While the Gervais Street façade of the tower fronts onto the plaza and overlooks the Capital, the main lobby entrance fronts onto Main Street. This allows the building to reference both the importance of being on Main Street while addressing the Capital Building and maintaining direct access to the public plaza. 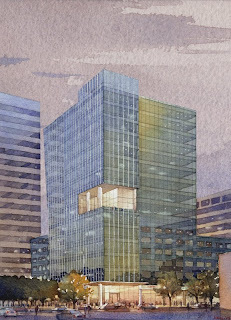 The addition of a two-story tall terrace on the first office level, approximately eighty feet above the plaza, accents both the Main Street lobby entrance and the verticality of the tower. Views from the terrace across the plaza to the Capital grounds will be unparalleled in all of downtown. The New Nick - Coming in 2009! Located on the Horseshoe at The University of South Carolina - The McCutchen House offers cooking & wine classes as well as some of the finest dining. Chef d'jour Classes at McCutchen House -- Enjoy a morning of culinary instruction at the Chef d’jour classes! These half-day cooking classes designed to help the layperson get a leg up in the kitchen. $50 per person, 9 am –1 pm unless otherwise noted. For reservations, call (803) 777-8225 or visit website. January 26, The Basics is the most requested class taught by our highly trained Culinary Instructors. Designed to teach the average home chef how to develop their kitchen skills, you will be taught how to prepare your own stocks, make the five base sauces, and how to chop and dice like a TV chef. We're sorry, January 26 The Basics is FULL. February 9, Valentine’s Day: Don't know what to cook up for that special person in your life? Let us teach you new and exciting foods to serve the one you love. You will learn how to prepare the meal from start to finish. March 8,The Basics is the most requested class taught by our highly trained Culinary Instructors. Designed to teach the average home chef how to develop their kitchen skills, you will be taught how to prepare your own stocks, make the five base sauces, and how to chop and dice like a TV chef. April 19, Baking 101: Can?t bake but love to? Baking 101 is designed to arm you with the knowledge you need to bake. This class will cover topics from breads to cakes. Give us four hours and you?ll be baking with the best of them. May 3, Advanced Desserts: Not for the novice! This class is for those who have a passion for desserts. Learn how to make restaurant quality desserts. The fundamentals of plated desserts, followed by trained professional pastry chefs. June 7, Grill It! Develop techniques for grilling and cooking outdoors. Not sure when to use a marinade or rub? Are you rocky on grilling fish and vegetables? This class will give you the know how! Wine Classes -- Discover the wines and sample the proper foods from these regions. Enjoy a night of wine tasting and great food, tapas style. Wine events are $50 per person, except for series classes which are $179 per person. Beer classes begin at 6:30 pm. Wine classes begin at 6 pm. For reservations, call (803) 777-8225 or visit the website. Text or email you email address to nick@nickelodeon.org and they will email you details on upcoming features, plus a FEE ticket to any movie you chose. Main Street will see the addition of The Sheraton Boutique Hotel in Spring/Summer of 2008 - which will include Starbucks, a basement pub with live music, a martini bar in an old bank vault, high end restaurant, and a rooftop (indoor/outdoor) sky sushi bar! Look for further development news by Capitol Places on the residential and mix-use front. New movie theater will open on Main Street in the historical Fox Theater in 2009! Nickelodeon Fundraising is taking place and they will renovate this beautiful old theater. Success has been seen in commercial, residential and soon RETAIL! Columbia, SC – January 16, 2008 - City Center Partnership is pleased to announce that Amy Stone has been selected as the first retail recruiter for downtown Columbia. “Amy brings a wealth of experience in sales from recruiting contributors for non-profit organizations to soliciting donations from alumni, which is complimentary to what we’ll be doing for retail in Columbia,” said Midge McCauley of ERA in Washington, D.C., who is currently creating a comprehensive retail plan for the area. “Amy was selected from a group of qualified people. Ultimately her background, energetic personality, charm, and business relationships in Columbia and around the state stood out over the competition,” said McCauley. Before joining City Center Partnership, Stone was the owner of AES Consulting, where she provided expertise in annual giving, capital campaigns, and special events. For more than 25 years, Stone has been Director of Development for Hammond School, Arizona Museum of Science and Technology, and The Baylor School. Stone is currently serving as the President-Elect for the University of South Carolina Alumni Association Board of Governors. She is a member of the Association of Fund Raising Professionals, the Rotary Club of Columbia, Historic Columbia Foundation Garden Restoration Steering Committee, and a Graduate of Leadership Chattanooga. City Center Partnership, Inc. (CCP) is a non-profit organization that manages South Carolina’s first managed Business Improvement District in the 36-block area bounded by Gervais, Elmwood, Assembly, and Marion streets in downtown Columbia. Over $200 million dollars has been invested on Main Street over the last five years and another $100 million to be completed in the next two years. It has created wonderful public spaces, office buildings, apartments, condos, and retail spaces. There are now over 235 people living in a three-block stretch of Main Street. The City Center Partnership provides Hospitality Services to downtown residents, visitors, and employees by our yellow shirted Safety Guides. This service includes vehicular or pedestrian escorts anywhere with he downtown district - great for a ride home from your favorite restaurant or a walk to the bank with a friendly Safety Guide by your side. Shopping is quickly becoming a reality on Main Street - 10 new downtown shops and services opened in 2007 and much more to come. Street level retail is now priority #1 for downtown! They City of Columbia and City Center Partnership have invested in a retail strategy/implementation plan to compliment the existing revitalization of Main Street. On Wednesday January 09,2007 an editorial was written in The State Newspaper. The information is actually about a City Center Partnership's Safe Team Member. Good Job Allen! Recently, a friend and I were walking back from exercising at Finlay Park in the early evening hours. We’d parked our cars in the metered lot near the bus station downtown. As we turned the corner to walk to our cars, a gentleman wearing a yellow-shirted uniform, whom I believe worked for the city of Columbia, introduced himself as Allen and walked us to our cars to ensure our safety. He asked that we check the backseats of our cars and then waited patiently until we were safely in our vehicles to continue patrolling the parking lot. My friend and I were absolutely and wonderfully surprised by this man’s gentlemanly and chivalrous behavior. While it may be his job to patrol the area, he went above and beyond the call of duty to ensure our safety. I have worked downtown for years and have never once had this experience before. I would like to thank Allen for his respectful and kind concern for my friend and me. The world would be a little bit safer and brighter if there were a few more gentlemen such as Allen. Developer Rick Patel plans to add a bit more pizzazz to the local hotel market with the addition of the Sheraton Columbia Downtown Hotel. The hotel — which will be boutique-style, housing 135 rooms and suites — is slated to open March 27 at 1400 Main St. It also will be home to Main’s first Starbucks cafe. The hotel replaces Republic National Bank built in the early 1900’s. The bank’s remaining vault on the first floor will serve as a centerpiece of one of the four bars and restaurants. The night was a blast as people experienced culture, architecture, living spaces and the unique vibe of Main Street. 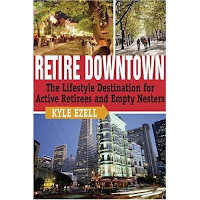 Columbia was recognized in Kyle Ezell's book - Retire Downtown "The Lifestyle Destination for Active Retirees and Empty Nesters"
This one of the southeastern's most exciting small cities, and a "Downtown to Watch" near miss. See more about what's happening at City Center Partnership, Inc's web site at www.citycentercolumbia.sc and click "Live Downtown." On November 8th, Urban Tour 07 will kick off from the Vsion Condo Model. An evening packed with food, fun, and entertainment, Urban Tour 07 will light up the town. Starting at 5pm from Vsion, enjoy cheeseburgers in paradise and meet Cocky, Ms. South Carolina, and Ms. Lexington. Then crawl your way down Main Street with over 20 street performers ending with a party at the historic Tapps fountain room. Residential development is on the rise in downtown Columbia, and office space occupancy is at an all-time high. The weak link is shopping. To boost retail downtown, Columbia City Council is preparing to pay $200,000 for a study to identify what kinds of stores are needed and how to recruit them. That would be followed by the hiring of a retail coordinator to recruit national retailers, a la King Street in Charleston, and local services, such as dry cleaners and specialty shops. The yearlong study would be conducted by consulting firm Economics Research Associates of Washington, D.C.
A main focus of the study will be identifying ways to revitalize Main Street and boost shopping options for visitors to the Vista. Midge McCauley, the firm’s principal, will head up the analysis. National retailers such as the Gap and Banana Republic are the mother lode, she said, and might be perfect for Main Street downtown or Lady Street in the Vista. Today, the only national retailer downtown is American Apparel, known for American-made T-shirts and youthful, racy ads. The City Center Partnership, which advocates and guides growth and business development on and around Main Street, would pay the salary of the retail coordinator hired. Dancing in the Street "A Blast from the Past" starring Charlie Brown's Coasters and The Foundations and featuring Fatback and The Groove Band. From 6pm - 11pm at Main and Lady Street downtown Columbia, SC. For more information, please call: 803.343.8750. Anniversary Car Show The Carolina Classic Car Club will host its Tenth Anniversary Car Show downtown Columbia on Main Street from 10:00 am - 7:00 PM. The club to provides an opportunity for the community to become interested in the recognition and organization of classic cars. Proceeds from this annual event help support the Eva P. Trezevant Memorial Library and Resource Center, 1429 Harper Street, a 501-3C non-profit organization which provides tutorial programs, computer classes for children K-12 and adults in the Waverly Community. For further information, please contact Mr. Allen Parks, Vice President, at 786-0671. 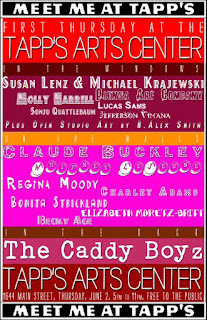 August 28,20078:00 pm - 9:30 pm501 Elmwood AvenueTickets are $5 for members, $10 for non-members. For children/students 6-18, tickets are $3 for members,$5 for non-members.Hear stories and tales of Columbia's past during tours of Elmwood Cemetery. These guided tours, led by a costumed interpreter, are scheduled during the full moon. The cemetery is the resting place for many of Columbia's prominent citizens as well as military personnel from several wars. Tours will be limited to 40 participants. Please reserve tickets by calling 803.252.7742 ext. 29. How walkable is your house, apartment, or condo? Well this new website will tell you if you dont already know! WalkScore will rate your home on how walkable it is. Why does walking matter? Well besides the obvious here is a slew of other great reasons! A new group is dedicated to promote the art and bring an abundance of public art to Main St. The public art will be visual, audio, and interative. Located on Main Street in the Arcade Mall, Salon Sole is now open for business. A new water sculpture is currently being put up on Boyds Plaza located in front of the Columbia Museum of Art. I believe it will be approximately 20ft high with some sort of water feature. 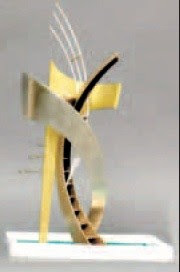 As seen in this rendering, it is a very unique and contemporary piece of public art. A nice addition to Main Street, completion is expected in July. Mayor Coble has been expressing his plans for further development of downtown retail. Coble has taken over where Terry Brown, CEO of Edens & Avant and Vice Chairman of City Center Partnership, left off at last Novembers annual meeting. Brown had asked the city for more assistance with retail incentives, amenities, and tax-increment financing, in hopeful efforts of enticing developers to take more risks with larger retail projects downtown. Coble reinforces Brown's message, and while speaking to the Columbia Rotary Club last month, he narrowed it down to the following five issues. 3. A better job by the city in making parking more customer friendly, even with additional parking planned and under construction. 5. A new signage system for the downtown area, called the Wayfinder Program, which has already been approved and paid for. The City Center Partnership and the city are looking forward to embarking on this dynamic retail initiative. Mayor Coble's remarks follow a recent trip to Austin, Texas to study their retail initiative with a delegation that included Jim Apple, Chairman of City Center Partnership, Matt Kennell, President and CEO; Frank Lourie, a longstanding merchant and baord member; Jim Gambrell, Director of City of Columbia's Office of Economic Development; and Councilman E.W Cromartie. The Historic Columbia Foundation has plans for a 21-block garden district bounded by Taylor, Calhoun, Marion and Barnwell streets and surrounding the city’s and county’s historic homes. In the 1800s, the area contained some of the South’s most revered gardens, but they fell into disrepair after the Civil War and in the mid-20th century were abandoned and plowed under. Now, Historic Columbia is resurrecting those gardens with public walks, interpretive signs and docents highlighting a different era of landscaping at each of the five properties. Planners said the project will make Columbia the nation’s first city to illustrate and interpret a century of landscaping — in this case, 1820-1920. Also, the district’s walkways will help connect the downtown areas of USC, Main Street, the proposed Bull Street neighborhood at the site of the State Hospital campus, and the Waverly neighborhood, including Allen University and Benedict College. Indie GRITS will present a fun, exciting and enlightening opportunity for experienced and first-time media makers to come together and share their interest in independent media production. Unlike many of the overbuilt and investor driven markets for condominiums in Florida, coastal markets and the west coast, Columbia continues to experience steady growth and appreciation. Nowhere is this more prevalent than the condominiums in city center Columbia. Over the last 10 years, the prices of the condos have increased every year with an average of 9.9%. The event is sponsored by City Center Partnership. The Columbia Festival of the Arts, in Columbia, South Carolina, is a celebration of the wonderful arts and culture we have in the Midlands that surprises people who visit our community for the first time. From April 26th to May 6th, 2007, we will be highlighting the amazing theatre, dance, music, visual arts and museum exhibits that are a part of this wonderful community and that we usually take for granted. Look for 2007 to be "The Tipping Point" for Main Street. Residential growth on Main Street will have doubled in 2007 with the additions of 75 apartments in the Barringer Building and 34 Condominiums at 1520 Main. New Sheraton boutique hotel will be opening at corner of Washington and Main with rooftop bar. Kickstand Photography recently opened their new studio. In April, a new sculpture with an interactive water feature will be built at the corner of Main and Hampton on Boyd Plaza in front of Art Museum. New retail is coming to life with specialty shops locating on Main Street. Argyle Social Club announces formation of new private social and dining club to be located next to the Columbia Museum of Art. The Business Improvement District will launch their Retail Initiative. Downtown Public Safety Plan to be implemented with significant increase in police and safety patrol. 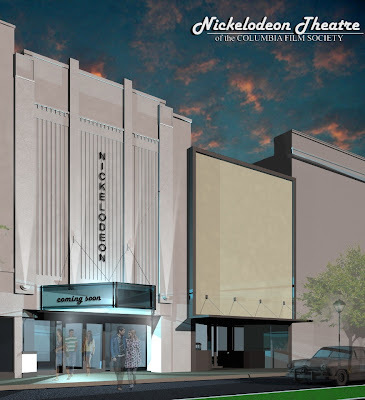 COMING SOON: Nickelodeon is renovating the old "Fox Theater"
Columbia is quickly become a vibrant and convenient urban atmosphere with numerous opportunities for varied lifestyles. "Capitol Places Apartments & Condos"
"Local Art Opportunities, News, Events & Commentary"